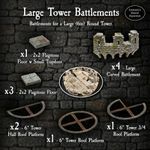 The Large Tower Battlements Pack is part of the Castle Builder System. It is made of "Dwarvenite". This item was initially available as an add-on to a pledge level during the Castle Builder System Kickstarter. This pack was specifically designed as an add-on to the Large Tower. The item comes in both painted and unpainted versions. CBS parts are from the City Builder System series.